Tonight on FOX Masterchef returns with an all new Wednesday, June 8, Season 7 episode 2 called, “Battle for a White Apron, Part 2,” and we’ve got your recap down below! On tonight’s episode, forty home cooks compete in Part 2 of the Season 7 premiere. On the last episode, in the season premiere episode, 40 of the best home cooks in America traveled to Los Angeles to compete in the MASTERCHEF Battle of the Apron challenge, during which they attempted to earn a coveted white apron and move forward to compete for the MASTERCHEF title, a cookbook deal and the $250,000 grand prize. Did you watch the last episode? If you missed it, we recapped it right here for you. 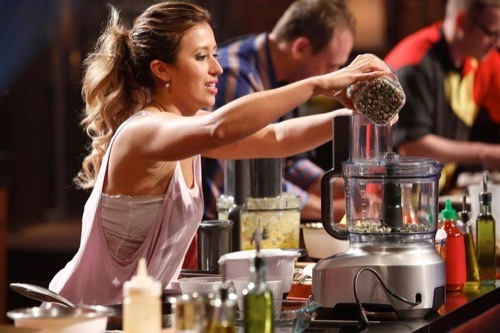 Don’t forget to join us for our live recap tonight at 8:00pm when MasterChef Season Seven episode 2 on Fox airs. While you wait for the recap, let us know how you like the seven season of MasterChef. On Part Two of Battle for a White Aprons, the judges continued to sort through leading home cooks in America to find the best of the best and those most deserving of a white Apron on this season of MasterChef. However, the first battle was a mere test of how far one contestant should go to impress the judges. A former frat boy and now server and a nail technician extraordinaire went head to head in the Battle of the Taco. Tacos generally being a flavorful and light dish, but both contestants had to elevate the taco into something unique. As well as put their own special signature on the dish. Only one contestant had gone too far with their dish. Dan the Frat Boy decided to wow the judges with his signature Beer Battered Fish Tacos with Lime Crema. That Ramsay enjoyed by the way however Christina felt the fish might have gotten lost among the other flavors that she felt were too powering. So Dan’s Tacos while not perfect, was still a great dish and surprisingly it came out ahead when compared to Takeila’s. Takeila the Nail Technician had decided to introduce her signature Jerk Chicken Tacos with Waffles and Cayenne Maple Sauce and, while that was a very original idea, it had gotten a tad off message. It seems the addition of the waffles had been a little out of place on the dish so Christina had a hard time accepting it as part of the overall experience. And Ramsay hadn’t been all that sold either so the waffles ultimately cost Takeila her chance at a White Apron. And so the remaining constants learned something with Takeila. While they should impress the judges with their dish, they shouldn’t lose sight of their overall goal or forget what the Battle was really about. In the next battle, which was Battle of the Hamburgers, two men went into the kitchen with their mother’s support to cook what was supposed to be their best version of the Hamburger yet it appears that both of their best versions needed some work. Alejandro who was a Venezuelan Voice Over Actor went up against Zack who was Good American Southern boy and Construction Worker. Yet, there was no true winner with these two when both received negatives critiques. Zack had come up with a Black and Blue Burger with Onion Rings and Jalapeno Strings and it turns out he hadn’t properly balanced the dish. His burger was too spicy and both judges had felt it was drowning in seasoning. And Alejandro’s burger which was Hamburguesa Con Todo with Yuca Fries was bit all over the place. The presentation needed work and Christina could actual taste in the burger that Alejandro’s pan hadn’t been as hot as it should have been. So not one of them produced the perfect dish and therefore the decision the judges had to make was a difficult one. But ultimately they went with Alejandro’s dish that showed just a bit more promise. Only the decision had been easier for the judges when it came to the Battle of the Shrimp and Grits. In a rare four-way battle, four contestants had to cook their best version of Shrimp & Grits and again it seems that some forgot what that meant. A young woman that allegedly spoke with the spirits had produced a dish her ancestor swore would win yet neither judge had been all that impressed with it. And another contestant had literally been out of the running the second the judges tasted his dish because he had burnt the shrimp. To burn the shrimp in a Shrimp & Grits is to basically say you’re done. So what ended up winning in a lackluster Battle of the Shrimp & Grits was one contestant going with the Traditional Shrimp & Grits and another working up a unique Italian Shrimp & Grits Cake. And funnily enough they were the complete opposite of each other, flavor wise. But the Battle of the Surf & Turf was the final battle of tonight’s episode of “MasterChef” and it was definitely nerve racking. Shaun who was a DJ in Las Vegas had felt that he had a handle on things when, out of nowhere, he nearly ran out of time before he could truly put his dish together. Apparently Shaun had a hard time getting his seafood portion to work with him so he ended up spending too much time trying to fix everything and not enough with plating his dish. However, at the last second, he was able to pull himself and hid dish together. So Shaun’s Seared Filet Mignon & Lobster Tail with Bone Marrow Beurre Blanc and Foie Gras did look pleasing. Only it was too much. Shaun had gone big, but the judges wondered if he should have pulled back some. Meanwhile Shaun’s competitor James had created Seared Rib Eye & shrimp Balls with Butter Poached Lobster Tails and it tasted delicious though it wasn’t as stylistically pleasing as Shaun’s dish. So on this one, Christina and Ramsay kept on having a difference of opinion. Christina had felt that Shaun’s dish was too much while Ramsay had still been impressed with all that Shaun managed to do in forty-five minutes. Yet, when all was said and done, Shaun proved to be the winner with the many techniques he showed on one dish.